Pete found his happy ending. Betty and Don? Not so much. 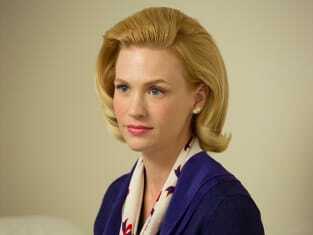 The focus was extremely narrowed on Mad Men Season 7 Episode 13 and it felt great to be out of McCann Erickson. We were only there for a week, but that was one week too long. With only one hour (I'm guessing next week will be an extended episode such as this) remaining, and considering the feel of "The Milk and Honey Route," it sure seems like what we're going to get will be much like The Sopranos ending. Meaning, it won't really end at all, but instead remind us that life goes on and doesn't finish neatly tied in a bow no matter how much we'd like it to. It's been happening for a while now, but Pete finally had all of the stars aligned to make his happy ending reality. Running into Duck in the elevator wasn't sheer providence, as the man was using Pete as one of his ideal candidates to land a position for himself as a recruiter. If he could get someone on board with Lear Jets, he would be able to eat for a while. He pretended he was using Pete as an assist to sell Duck's abilities, but Duck was really pushing Pete for the job at Lear. While Pete was still hanging onto four more years at McCann and a million bucks, Duck was pretty sure he could swing an answer to that. He did. With that came Pete's chance to stop making moon eyes at Trudy and eating pies in her kitchen after she had gone to sleep. He had something to offer her and Tammy. A real life outside of the city, but with the chance to go anywhere any time they wanted, courtesy of his new employer. It was quite simply the most romantic thing Pete had ever done on the show. He said all the right things to Trudy and never fumbled once. Right down to, "Say yes with your voice and not your eyes." Damn, he even had me going there! Trudy vowed Pete would never hurt her again, but Pete was young and lost in a world a step above who he really was inside when he was married to Trudy. He messed up. That goof ball who was in California is long gone and the wild side is out of his system. I think they're going to make it this time. In Kansas, no less. Betty isn't going to make it, but she's going to die trying. I guess someone had to be touched with disaster before the end; I just wish it wasn't her. She's come so far from the cold, hard woman she once was, although she is trying her damnedest to pay her a visit again to save face while she struggles to come to terms with dying. I've always wondered how I'd handle learning I might have nine months to a year to live. I'd like to think I'd be as strong as Betty. Did she go a little too far to the edge? Yes, but that's because she knows if she gives an inch, her family will pull her a mile and she doesn't want to be sucked somewhere she doesn't want to go. The letter to Sally was beautiful, especially in that she gave her her blessing to live life as an adventure. That's the kind of thing that will stay with Sally for the rest of her life. Hopefully Betty will write little notes to her boys for when they're older. When Sally finally broke down and cried, I knew exactly how she felt, realizing she'd never see her mother alive again. Wow. Betty will continue going to school and living her life as normally as she can until she drops. There's both courage and cowardice in that move. Everyone will remember her a little differently. While all of this was going on, Don was still intending to be driving around the country. He was going in circles, having passed through Wyoming and then back to Kansas and he was on his way to the Grand Canyon when his car broke down in what he got to thinking was kind of an idyllic little world. The motel owners offered up their own supper for room service, liked his handy man skills and wanted him to stay in town an extra night so he could join the old man at the Legion for a night of war stories, booze and sing alongs. Except small towns are also the places you need to look out for when you're stranded with your car in a horror movie and Don soon discovered there's some truth to that. His happy male maid stole the money collected at the Legion and the friendly veterans blamed Don, beating him in the face with a phone book and stealing his car. Waving your money around gets you into trouble. Don didn't let it get him down, though. He had the kid get the money, after a stern talking to about how doing what he's doing was leading him down a dark path he didn't want to visit. Don should know how easy it is to burn your bridges. Don returned the money, gave the kid a ride to the bus stop and gave him his car. Is he going home? Everyone is letting go. Pete, Betty and Don all had opportunities to get angry or make unwise choices because of what was laid before them, but they're over it. They're ready to move on and change. They've been through enough of the bad times. It's kind of a relief, but like Betty's diagnosis, it doesn't mean the good time start to roll in. Next week on Mad Men Season 7 Episode 14 we should learn how we're leaving Don. Will he learn about Betty? Will there be a time jump? Will he just go silently into the night? I'm not sure I'm ready to let go, but there isn't much of a choice in the matter. Don't forget you can watch Mad Men online if you've missed out on any of the stunning series.